Just found out Blog Her '12 will be in N-Y-C!! My favourite city of all time since my husband and I visited there in 2005 - our first trip together. 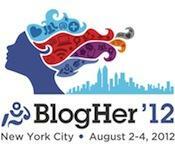 Blog Her '12 take place from August 2 - 4, 2012. Early bird pricing is currently available.